The playground of the rich and the beautiful, downtown New York's nightlife spectacles and power of self-invention incubated pop icons from Andy Warhol to Lady Gaga. NYU sociologist Victor P. Corona sought a new education, where night classes held in galleries, nightclubs, bars, apartments, stoops, and all-night diners taught him about love, loss, and the living possibilities of identity. Transforming himself from dowdy professor to glitzy clubgoer, Victor immerses himself among downtown's dazzling tribes of artists and performers hungry for fame. 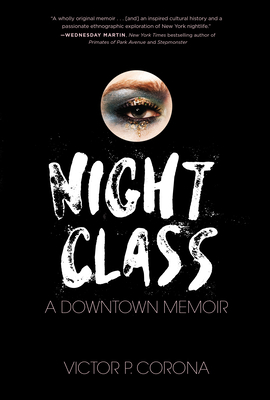 Night Class: A Downtown Memoir investigates the glamour of New York nightlife. In interviews and outings with clubland revelers and influencers, including Party Monster and convicted killer Michael Alig, Night Class exposes downtown's perilous trappings of drugs, ambition, and power. From closeted, undocumented Mexican boy to Ivy League graduate to nightlife writer, Corona shares in Night Class the thrill and tragedy of downtown and how dramatically identities can change. Victor P. Corona, Ph.D., is a sociologist at New York University. He has been mentioned in The New York Times, New York Post, The Times (London), Glamour, Town & Country, BlackBook, Daily Beast, and The Washington Post. Born in Mexico City, Victor grew up in the New York suburb of White Plains. He now lives in Harlem.